Language is the "most human" of all cognitive abilities. In this way begins the first chapter of this new E-book by Dr. Marcia Radanovic and Dr. Leticia Lessa Mansur that fills a gap in the approach to language disorders. Language is altered in most neurological diseases, and this may occur even before other symptoms appear. The first chapter covers normal language as a cognitive model of the ability that has made us unique in the animal kingdom: linguistic communication. The authors guide us through the rich pathway shared by various fields of knowledge: Medicine, Linguistics, Speech Pathology, Social Sciences, Computer Sciences and Psychology, leading us to perceive how interconnected are these areas with those of Neuropsychology and Neurolinguistics. Facing normality makes us recognize the disease. This is undoubtedly the most beautiful chapter in this E-book. The beauty of the text and clear diagrams permits the construction of a picture about normality to be outlined in our minds, ready for comparison with the pathological. 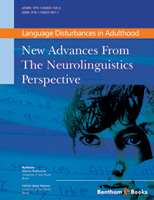 In the following chapters we face the changes of language found in neurological diseases. In the various forms of dementia, language disturbances are often the first symptom and always critical for differential diagnosis. In the description of focal lesions, we encounter important anatomical, clinical and prognostic references. Aphasia, for example, is considered a risk factor for increasing morbidity after stroke. It was confirmed that comprehension deficits are powerful negative factors for rehabilitation, regardless of patient’s engagement in Speech Therapy. The chapter on language disorders due to right hemisphere lesions is what every clinician has been waiting to read in the last years. We have seen literally translated into words what we encounter in our everyday clinical practice. The same is true about the chapter on subcortical aphasia and the endless debate about the role of subcortical structures in language processing. These are topics that all professionals who assist and rehabilitate patients with neurological diseases were longing for. Finally, "Language and Cognitive Domains" and "Language and Functional Neuroimaging" are chapters that were better than expected, bringing the different contributions of experts in this area. This is a modern book, written in a clear, precise and accessible style; certainly a product derived from the knowledge and experience of the authors on the study of language. Together, Leticia Lessa Mansur, the Speech Therapist, and Marcia Radanovic, the Neurologist, trace a secure path to the comprehension of normal language and its disorders. Interdisciplinarity is the only way to “knowing well” and knowing well is the only way to “caring well”. I was honored to be invited to write this foreword. I am a Neurologist, and also a Professor for Speech Therapists; our work strives for an interdisciplinary approach. Together, the Neurology, Otorhinolaryngology, Speech Therapy, Physiotherapy, Occupational Therapy and Education Departments in our University try to create a professional and respectful service in order to provide the best possible treatment to the patient. This book will be of great value to all professionals and students who, like us, have a passionate interest in the greatest gift that Nature has given us: Language. Tania Maria da Silva Novaretti, M.D., PhD. Language is the most versatile and fascinating of all human cognitive functions, constituting a field of interest in very different areas, from Linguistics to Speech Therapy, from Philosophy to Computational Sciences, including Psychology, Neurology, Biology, and Social Sciences. The current multidisciplinary approach that has been used in the study of Language, with the emergence of related disciplines such as Neurolinguistics, Psycholinguistics, Neuropsychology and Biolinguistics has allowed a breakthrough in our knowledge on linguistic processing and its neuroanatomical bases. Based on this premise, our intention was to gather in this E-book a few of the various perspectives by which Language can be studied, so that students and professionals from different areas can benefit from the most recent advances made in this field. To accomplish this objective, we begin with an overview on language processing in normal individuals, followed by an exposition of language dysfunctions that may occur in individuals with cerebral injuries, and finish with the latest findings about the neuroanatomical substrate of this function. The scope of this E-book is to provide the reader with an update on the following topics: - New cognitive models of comprehension and production of normal language - Classical aphasias: new concepts - New perspectives on the understanding of aphasic symptoms - Interface between language and other cognitive functions - Functional neuroimaging and language - Other language disturbances: beyond the aphasias. This E-book was fully written by a Neurologist (M.R.) and a Speech Therapist (L.L.M. ), and our purpose is that the issues presented here may be of interest both for teachers and researchers in Neurosciences and Linguistics as well as for professionals who treat patients with disorders of language and communication, such as Neurologists, Psychiatrists, Psychologists, Neuropsychologists, Speech Therapists, and Occupational Therapists, among many others.